Objective: Improving clinical teachers' ability to teach interprofessional collaborative practice warrants development in current faculty training programs; in particular, current education training emphasizes experiential learning and multiple teaching strategies. The purpose of this study was to establish a teaching model to apply interdisciplinary collaborative care and to improve clinical teachers' execution of interprofessional practices. Materials and Methods: Health-care faculty members were studied; this study assessed a teacher education curriculum for interprofessional education (IPE) and applied an objective structured teaching exercise (OSTE) to evaluate IPE execution by clinical teachers. 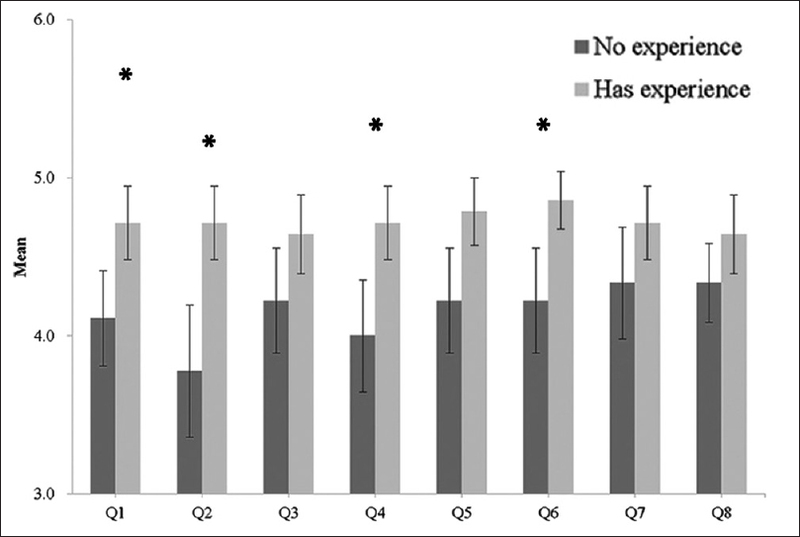 Results: The OSTE improved clinical teachers' IPE execution, verifying the necessity for multistrategy teaching in faculty training programs. Conclusions: This study provides different types of interprofessional faculty training and assessments. Development of an OSTE requires long-term planning, and IPE should also be incorporated into formal programs. Interprofessional education (IPE) is a strategy for promoting public health and reducing medical resource consumption. The World Health Organization (WHO) has defined the details of interprofessional collaborative practice (IPCP) and suggested that IPCP be integrated into clinical teaching. The WHO also emphasized that medical teams should be able to effectively communicate with each other when caring for patients. Continually improving integrated training programs among professionals is essential in responding to changes in society. It is the faculty who provides the frontline instruction of IPE, and training programs also need to offering various aspects of IPE knowledge, skills, and attitude competency. Designing course content on the basis of curriculum design theory can improve the integrity and efficiency of the teaching program. To meet organizational needs, an administrative supervisor, in particular, should participate in the curriculum design. The concept of IPCP has been promoted in clinical care in Taiwan for years. A consensus camp was held in Eastern Taiwan in December 2016 to understand the current situation and problems associated with promotion of IPE. Eastern Taiwan comprises only one medical center and eight regional and district hospitals located within a range of approximately 300 km. Therefore, this area has insufficient medical resources, and arranging faculty training under such situations is difficult. In 2012, medical managers in this region established a training committee to increase mutual support among hospitals and conduct collaborative training. Since 2016, the core curriculum has focused on strengthening IPE: (1) communicate in a responsive and responsible manner that supports a team approach, (2) apply collaborative leadership practices that support practice and team effectiveness, (3) work in a patient/client-centered interprofessional team to create and maintain a climate of collaboration, mutual respect and trust, and (4) leverage the personal abilities and characteristics and professional expertise of each individual to optimize team function. The core curriculum has also involved exploring the IPE situation in different organizations. Conclusions from the preliminary consensus conference and focus groups revealed that clinical teachers require more curricula for clinical scenarios. To address this requirement, the primary committee members designed multiple courses using “experiential methods” aimed at encouraging clinical teachers to participate in simulation case studies to understand interdisciplinary professionals' perspectives during controversial events. Sharing experiences stimulates creativity among disciplines; thus, regional characteristics were incorporated into the simulation cases to provide participants with experiences that they could apply in their disciplines (or organizations) to deal with different situations. For experience learning, participants' self-reflection and colleagues' inspiration are crucial in the training program for clinical teaching; moreover, learning scenarios should adequately resemble clinical situations. Although certain courses and studies revealed that most of the participants enjoy group discussions, hands-on practice is highly crucial. Colleagues' feedback and appropriate facilitator guidance would also improve the outcome of courses. Some challenges can be added to the design of the IPE curriculum, such as promoting barriers and failures in IPE cases or adding complex and highly stressful scenarios. In clinical situations, health-care professionals may not necessarily be familiar with interprofessional cooperation; therefore, assistance from facilitators is required at the beginning of the education program. Mutual encouragement among peers and synergistic problem-solving models are all possible resources to enhance the teacher education curriculum. Teachers' self-assessment does not directly reflect changes in their teaching behavior; research has indicated the necessity to develop an evaluation method for directly assessing teaching performance using an objective structured teaching exercise (OSTE). An OSTE, similar to an objective structured clinical examination, entails conducting teaching exercises in a standardized situation. However, an OSCE is conducted with standardized patients, whereas an OSTE is conducted with standardized students. The overall study objective is to develop an OSTE that includes video clips and standardized students. Participants would be expected to demonstrate their knowledge, skills, and attitudes toward IPE and to exhibit characteristics of self-reflection and the ability to collaborate interprofessionally. The research participants were from various medical disciplines at a medical center in Eastern Taiwan, and judgment sampling was used to select four members – nurses, medical technologists, dietitians, and pharmacists, they had completed of 1-day IPE lecture-based workshop once. According to the proportion of students in each category, a control group of certified clinical teachers in these professional categories who had no IPE faculty training experience were invited to participate in this study. To ensure participants' safety and rights, this study was conducted after being reviewed by a human subject committee (IRB105-35-B). The study was conducted in accordance with the Declaration of Helsinki and was approved by the local ethics committee of the institution. Informed written consent was obtained from all participants before their enrollment in this study. Three expert multidisciplinary team (MDT) meetings were convened. In these meetings, the OSTE stations were established of two characteristics: (1) chain of stations, conceptualized as a long case consisting of three stations designed to reflect the potential diversity of patient assessment in a daily interprofessional meeting. The scenario objectives were to understand how to prevent and manage conflict in the workplace and to learn about de-escalation strategies and assessed whether teachers could give feedback effectively about IPCP. The prerecorded video demonstrated the MDT meeting discussion. This model could comprise a chain process that the individual looks at a situation and thinks about their thoughts and feelings at the time of the incident. (2) IPE trilogy: initial (I)-process (P) and evaluation (E) roles. Initial, in the first station, participants were asked to join IPCP rounds to discuss a case of diabetes complicated by cardiovascular disease with standardized student. The teachers were expected to communicate with the standardized students about learning objectives and improve active learning. In second station, they need watched the prerecorded video, saw the meeting as faculty and afterward meet with the standardized student (as postgraduate year 1 [PGY1]), discussed key concepts with them. In the third station, the teachers were expected to provide feedback on problems they found in the prerecorded video. Medical students were trained a standardized students, as well as to provide feedback to faculty. Each participant had 30 min to complete the whole exercise. The teachers were requested to complete a survey, and we also collected evaluations of teacher performance from the standardized students. The results were analyzed using descriptive statistics and the Wilcoxon test. A total of 23 clinical teachers participated in the OSTE; 14 (60.9%) were nurses, 5 (21.7%) were pharmacists, 3 (13.0%) were medical technologists, and 1 (4.3%) was a dietitian. The average length of teaching experience was 9.7 years (range, 0.15–26.9 years). A total of 14 (60.9%) participants had participated in IPE workshops previously. The overall average score for satisfaction with the OSTE was 4.2 (out of 5 points), and there were no significant differences between genders or specialties. Among the scale items, “the contents of the exercise are helpful for teaching IPE in the future” had the highest score. The teachers' self-assessment scores on their knowledge of IPE teaching ranged from 3.3 to 4.3. The overall average score at the first station – “the clinical teacher's ability to guide students to perform IPCP” – was 1.6. Among the items, “the faculty can deliver the objectives of IPCP” and “the faculty's performance in answering PGY students' questions” had the highest average scores (1.9), followed by “the faculty can listen to and respect PGY students' opinions” (1.8). “The faculty encourages PGY students to actively participate in the discussions” had the lowest score (1.1). For the second station, the average feedback score for the videos was 72.2 (out of 100 points). At the third station, “the faculty's feedback and teaching performance” had an overall score of only 1.0. In particular, “the faculty praises PGY students in the meeting” and “the faculty provides suggestions for improving students' performance in the meeting” had the lowest scores (only 0.7 out of 5 points). The details are listed in [Table 1]. The Wilcoxon test was used to further explore the background and performance of faculty. The teachers were divided into two groups according to seniority. The first group comprised teachers who had taught for 7 or more years, and the second group comprised teachers who taught for <7 years. The statistical analysis indicated that the two groups did not differ significantly in the scores for all indicators, that is, seniority did not influence teaching ability in IPE. The teachers were divided into two groups according to their IPE workshop experience. The first group comprised those who had participated in IPE workshops before the OSTE, and the second group comprised those who had never participated. 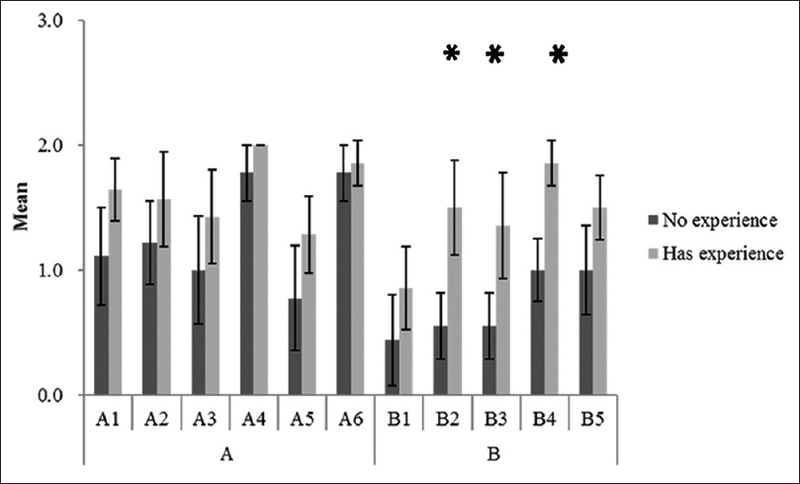 Before the OSTE, the first group had significantly higher scores for IPCP knowledge than those in the second group (P < 0.05); however, after the OSTE, no significant difference was found between the two groups regarding teaching perception of IPE. At the first station, there was no significant difference between groups for the item “the teacher instructs students to execute IPCP.” At the third station, with feedback provided by the standardized students and self-assessment by the teachers, the results indicated that the teachers in the first group had significantly higher performance levels than those in the second group. The details are presented in [Figure 1], [Figure 2], [Figure 3]. In this study, clinical teachers were evaluated on IPE teaching ability in an OSTE. After the exercise, they demonstrated improvement in the acquisition of the knowledge, skills, attitudes, and behaviors of teamwork. 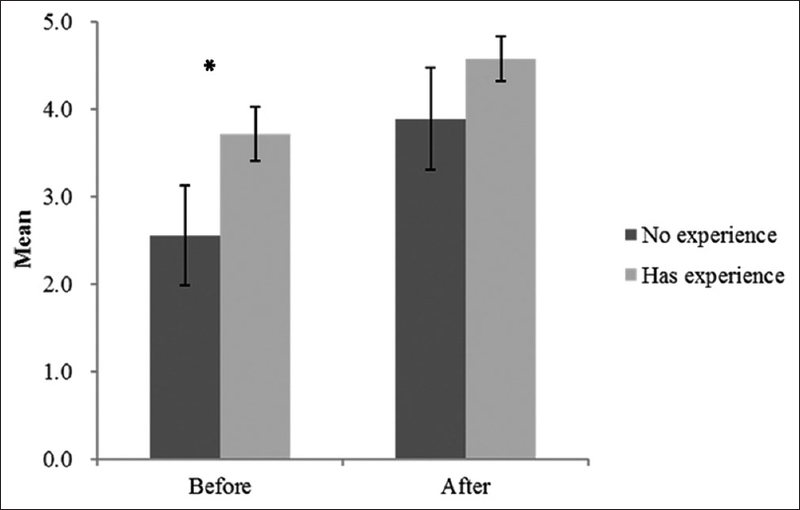 Notably, the feedback from standardized students was crucial for clinical teachers to improve their teaching performance. Through this program design and simulation training, a few essential conclusions could be made. The most positive feedback was that clinical teachers could understand the roles of different disciplines and their ability to contribute to patient needs. The challenge is that such programs are costly and require appropriate locations and course designs. Commuting is a problem for participants in remote areas. This poses certain difficulties in such combined training, but it also accentuates the value of cooperation. The exercise improved the clinical teachers' mutual recognition of their professions, and it is also expected to enhance communication between teachers, students, and different disciplinary perspectives. Moreover, the effectiveness of knowledge, skills, and attitudes toward MDT work was assessed in this study. Our study participants had opportunities for collaborative learning. Considering the multiprofessional nature of health-care delivery, it is crucial that IPE trilogy activities should be created where all health professions learn with, about, and from each other. This requires long-term planning, and IPE should also be incorporated into formal programs. IPE not only involves demonstrating the overall medical education framework but also entails cultivating knowledge of the functions of medical professionals, teamwork skills, and practical feedback. The objective of IPE is to create a friendly and positive collaborative environment and contribute to patient care. Buckley S, Ambrose L, Anderson E, Coleman JJ, Hensman M, Hirsch C et al. Tools for structured team communication in pre-registration health professions education: A best evidence medical education (BEME) review: BEME guide no. 41. Med Teach 2016;38:966-80. Mickan S, Hoffman SJ, Nasmith L, World Health Organizations Study Group on Interprofessional Education, Collaborative Practice. Collaborative practice in a global health context: Common themes from developed and developing countries. J Interprof Care 2010;24:492-502. Nisbet G, Hendry GD, Rolls G, Field MJ. Interprofessional learning for pre-qualification health care students: An outcomes-based evaluation. J Interprof Care 2008;22:57-68. Willgerodt MA, Abu-Rish Blakeney E, Brock DM, Liner D, Murphy N, Zierler B. Interprofessional education and practice guide No. 4: Developing and sustaining interprofessional education at an academic health center. J Interprof Care 2015;29:421-5. Hall P, Weaver L. Interdisciplinary education and teamwork: A long and winding road. Med Educ 2001;35:867-75. Steinert Y, Mann K, Anderson B, Barnett BM, Centeno A, Naismith L et al. A systematic review of faculty development initiatives designed to enhance teaching effectiveness: A 10-year update: BEME guide no. 40. Med Teach 2016;38:769-86. Fluit CV, Bolhuis S, Klaassen T, DE Visser M, Grol R, Laan R, et al. Residents provide feedback to their clinical teachers: Reflection through dialogue. Med Teach 2013;35:e1485-92. Ber R, Alroy G. Twenty years of experience using trigger films as a teaching tool. Acad Med 2001;76:656-8. McCutcheon LR, Whitcomb K, Cox CD, Klein MS, Burley H, Youngblood T, et al. Interprofessional objective structured teaching exercise (iOSTE) to train preceptors. Curr Pharm Teach Learn 2017;9:605-15. Veitenhansl M, Stegner K, Hierl FX, Dieterle C, Feldmeier H, Gutt B et al. 40th EASD annual meeting of the European association for the study of diabetes: Munich, Germany, 5-9 september 2004. Diabetologia 2004;47:A1-464. Julian K, Appelle N, O'Sullivan P, Morrison EH, Wamsley M. The impact of an objective structured teaching evaluation on faculty teaching skills. Teach Learn Med 2012;24:3-7. Boillat M, Bethune C, Ohle E, Razack S, Steinert Y. Twelve tips for using the objective structured teaching exercise for faculty development. Med Teach 2012;34:269-73.